Two survivors prepare food outside the barracks. 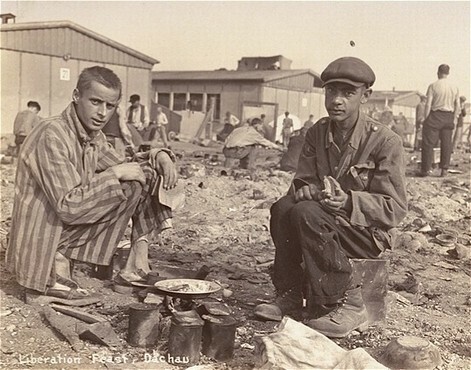 The man on the right is presumed to be Jean (Johnny) Voste, born in Belgian Congo, who was the only black prisoner in Dachau. Dachau, Germany, May 1945. This image is among the commonly reproduced and distributed images of liberation. These photographs provided powerful documentation of the crimes of the Nazi era.